MDT is the Official Website of the Mount Damavand Guides Iran, the leading tour organizer for hiking & trekking, mountaineering and climbing tours. The most experienced Iranian guides who are mainly focused on Damavand Iran. Experience Iran mountains with the best services possible. 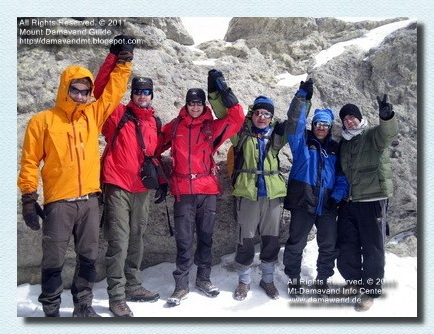 MDT guides are specialists in Damavand ascend tours, some have climbed more than 100 times to the Damavand summit and are the members of Damavand Century Club, and some are members of Mountain Federation of Iran, these high qualified guides share their experience to give you the best chance of success to summit of Middle East. 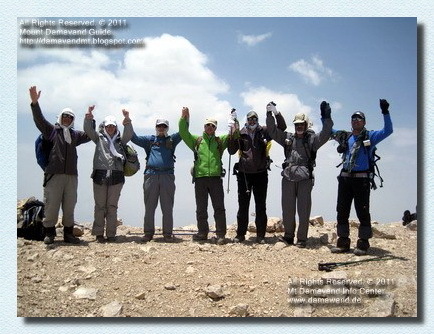 MDT team consist of the mountaineers who have been climbing in Iran for about 30 years and guiding for 20 years, our guiding group are guarantee of safety and quality days on the mountains. We organize quality trekking tours which range from a simple summer hiking, ideal for complete beginner, up to advanced alpine style winter climbing. If you are planning to visit Damavand Iran for trekking, climbing or ski mountaineering then this is the right place to get all the necessary info to enjoy your mountain tour. Using any of our Services or Guide and working with us means you have read this Disclaimer and you are agree to our terms. Clients and users expressly agrees that use of the Mt Damavand Tour (MDT) and Mount Damavand Guide (MDG) website/weblog or its services is at the client's/ user's sole risk. Neither MDT/MDG nor any of their respective agents, guides, employees, third party content providers warrant that the MDT/MDG website will be error free, nor do they make any warranty as to the results that may be obtained from use of the MDT/MDG or its services, or as to the accuracy, content or reliability of any info, service provided through the MDT/MDG. This disclaimer of liability applies to any damages, injury or death caused by any failure of error, mistake, performance, omission, defect, delay in operation or communication failure, theft or destruction, alteration of, whether for breach of contract, negligence, tortuous behavior or under any other cause of action. User specifically acknowledges that MDT/MDG is not liable for the, offensive or illegal conduct of other subscribers or third-parties in cases including but not limited to any interactive communication on or through the site and that the risk of injury from the foregoing rests entirely with user(s) and clients. MDT/MDG is not responsible for the content of external internet sites. We strongly recommended you to have all risk insurance that covering medical and evacuation from remote area. The insurance should cover also helicopter flight that could occured in Mt. Damavand expedition. Copyright © and Database Right MDT. All rights reserved. No part of the MDT may be reproduced stored or transmitted in any form without link to us or without prior written permission. Specialist in Damavand guided tours and ascends. Necessary info for Iran mount scaling tour. The ultimate outdoor tour and travel guide based in Tehran. damavand, tour, trek, trekking, hike, hiker, hiking, mount, mountaineering, picture, photo, ski, skiing, skitour, skitouring, visit, visiting, video, weather, forecast. Mt Damavand climbing tours 2015. Tailor made mount climbing tour organizer. Hiking & trekking mountaineering, rock and boulder climbing tours. Persian cultural, historic, nomad and silk road tours. Safe ascends to Volcano Damawand. Iranian local mountain guide. Alpine style mountaineering groups. Persia mount tourism info center. Adventure travel tour. Guided tour. Photo picture and video gallery. Specialist in guided tours. Specialist in Mt Damavand guided tours and ascends. Essential info for Iran mount scaling tour. The ultimate outdoor tour and travel guide based in Tehran. Rock and boulder climbing tour 2015. Guided hiking & trekking adventure tours iran. Ski mountaineering and snowboard tour Alborz & Zagros Mountains. Expedition outdoor activity and adventure tour organizer. Technical info for safe climbs to the mountain. Hiking silk road tour. Demavend climbing tour. Mountain tour designer and guided tours. Spécialiste des visites guidées Mt Damavand et monte. Info essentielles pour la tournée en Iran échelle de montage. La tournée ultime extérieure et guide de voyage basé à Téhéran. Rock et l'escalade Boulder tournée 2015. 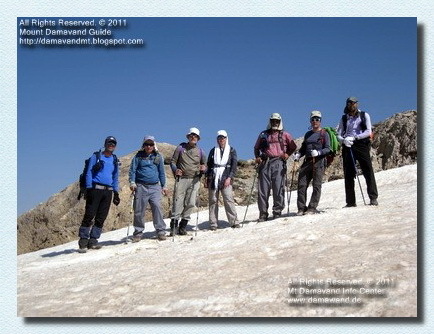 Randonnées guidées et randonnées Adventure Tours Iran. Le ski-alpinisme et de Snowboard Tour & Alborz monts Zagros. Expédition activité extérieure et organisateur de voyages d'aventure. Information technique pour sûre grimpe à la montagne. Road Tour pédestre de la soie. Démavend grimper tournée. Montagne tournée concepteur et visites guidées. Specialist in Mt Damavand Führungen und steigt. Wesentliche Informationen für den Iran montieren Skalierung Tour. Die ultimative Outdoor-Tour und Reiseführer in Teheran. Rock und Felsbrocken Klettertour 2015. Geführte Wander-und Trekking-Abenteuer-Touren Iran. Skitouren und Snowboard Tour Alborz & Zagros-Gebirge. Expedition Outdoor-Aktivität und Abenteuer Reiseveranstalter. Technische Informationen für den sicheren steigt auf den Berg. Wandern Seidenstraße Tour. Demavend Klettertour. Bergtour Designer und Führungen. Specialista in Monte Damavand visite guidate e sale. Informazioni essenziali per il tour Iran scala montaggio. Il tour ultima scoperta e guida di viaggio con sede a Teheran. Roccia e arrampicata boulder tournée 2015. Escursioni guidate e trekking avventura tour iran. Sci alpinismo e snowboard visita Alborz & Monti Zagros. Spedizione attività all'aria aperta e tour organizer avventura. Informazioni tecniche per sicuro si arrampica sulla montagna. Escursioni seta visita strada. Demavend climbing tour. Montagna visita designer e visite guidate. Please confirm when you receive our first email reply because we have had problems lately with emails intercepted by spam-filters set too high. 1- Write Damavand Tour in your email subject, this will help us to quickly recognize the real emails from spams. 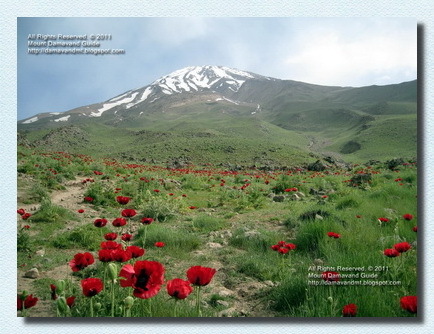 2- Be patience, with no exception, we will reply to all mails who have mentioned Damavand Tour in the subjects. 3- Privacy is our main priority. We hate spams as much as you do, we would not shared your info with the 3rd parties. 4- To get an accurate answer, write your mails in English. 5- Reply with the previous respond attached to your email. 6- If you do not receive any answer or an auto-reply within two days, you may try again, but it is recommended to look in your spam/junk box first. 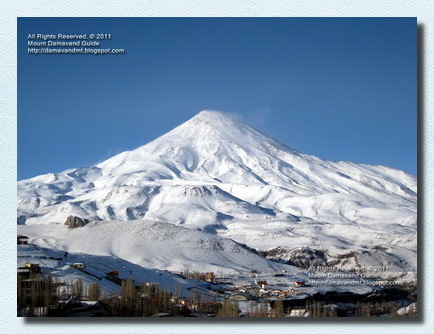 7- If you have any question about mountaineering Mt Damavand Iran feel free to ask. 8- If you have any suggestions about our websites/weblogs, don't hesitate to drop us a note. 9- Before asking, please try to find your answer in FAQs. 10- Please read Disclaimer/Warning carefully. The main aim of this topic is to help make you aware of dangers in mount climbing, it is necessary to have a certain level of experience in mountaineering as a requirement for joining a Mt Damavand climbing tour. High altitude mountaineering, such as climbing Mount Damavand Iran are amoung the most dangerous sport activity on earth, climbers get injured, harmed, wounded or die every year. Frankly we cannot think of any more dangerous sport activity on earth! Perhaps some climbers do not understand the risks, or do not take them seriously enough. It is impossible to know what it looks like to be on Damavand unless you're been to 5000m or higher before. Just because you can climb to upto 3000 meters mountains doesn't mean you can climb to 5671m. Only some of the equipments are similar, its a whole new game. They think accidents just happens to others or to those who make mistakes, one can get injured or die in differen ways on mountain. The strongest Mt. Everest climber ever, Babu Chiri Sherpa, simply stepped in the wrong place and fell into a crevasse and died in 2002. The weather and bad judgment are the main caused of deaths and injuries on mountains. Some climbers rely on weather forecast reports, but they are forecasts, and one day could be wrong too. Climbing too slow on the summit day may cause problems to some climbers if they reach late to the summit, they may get caught in the darkness and bad weather on the way down. Falls and avalanches are another major cause of injuries and deaths on the mountains, everyone has his own risk level. Mountaineering is a high risk activity, what is your risk level? A lot of people get injured or die in car and train accidents in the city, in airplane crash, by crimes or due to terror every year, much more than on the mountains. Everyone should make his own judgment on the risks. Traveling is a risk even to your friend or family's house, even in traveling you have to judge the level of risk you are willing to take. Spesialist i Mt Damavand guidede turer og stiger opp. Essential info for Iran montere skalering tour. Den ultimate utendørs tour og reiseguide basert i Teheran. Rock og kampestein klatring tour 2015. Guidet vandretur og trekking opplevelsesturer iran. Ski fjellklatring og snowboard tur Alborz & Zagros Mountains. Expedition utendørs aktivitet og opplevelsestur arrangør. Teknisk info for sikker klatrer til fjellet. Vandring silke road tour. Demavend klatring omvisning. Fjelltur designer og guidede turer. Специалист по горе Damavand экскурсиям и поднимается. Необходимая информация для Ирана тур масштабирование горе.Конечная открытом поездки и путешествия руководство базируется в Тегеране. Рок-валун восхождение тура 2015 года. Руководствуясь походы и походы приключенческие туры Ирана. Горнолыжного спорта и сноуборда тур Эльбрус и Загрос. Экспедиция активного отдыха и приключений организатор тура. Техническая информация о безопасном поднимается на гору. Туризм шелкового пути тура. Демавенд восхождения тура. Горный тур дизайнер и экскурсии. Especialista en el Monte Damavand visitas guiadas y asciende. Información esencial para la gira de Irán escala de montaje. El recorrido final al aire libre y guía de viajes con sede en Teherán. Roca y roca de escalada gira 2015. Excursiones guiadas y tours de aventura trekking Irán. Esquí Alpino y Snowboard Tour Alborz y montañas Zagros.